Indie anthology of short horror tales. Horror anthologies are, almost by their very definition, a mixed bag. Some will work and some will not because essentially it's an incredibly rare film that manages to get everything right, and when you add in the chaos of numerous directors and stories that must somehow hang together as a coherent whole, the chances of perfection are all but impossible. As if that weren’t challenging enough, you make it a low budget horror with an unknown cast and there you find Volumes of Blood: Horror Stories. As is usual with these films, VOB:HS features a framing device that should act as a way to contain and connect the disparate stories; but the film makers here push their ambition to breaking point and choose to employ a straggly series of opening stories with not one, not two but three false starts before we even get to the framing device. The body of the film consists of four short tales connected by the fact that they all happen within the same house's shady past. Given the nature of separate directors and stories it seems best to review each story on its individual merit, so here goes. Murder Death Killer: The first short of the film is about a botched robbery and the three criminals who eventually suffer a bloody run in with local legend Atticus Crowe. This one has a nice urban texture but two of the three protagonists are lacking in the acting department and that hurts the final product, though the deaths are gory and it's effectively directed by Nathan Thomas Milliner. Haters: This one segues from the first in a meta twist in which the two cinema-pest main characters are actually watching Murder Death Killer at the movies before being told to leave by an usher tired of their obnoxious antics. Said usher decides to follow them home and teach them a real lesson. Decently acted by the two hecklers with some snappy dialogue and a slightly silly denouement, this is hit and miss. Trick or Treat: A library security guard leaves his girlfriend alone on Halloween night only for her to come into bloody contact with a killer. This one has further repercussions throughout the rest of the stories and is intriguing, though it is somewhat undermined by its flat lighting and setting. A Killer House: Finally the framing story begins, and it's a good one. A darkly charismatic real estate agent shows a seemingly innocuous house to some prospective buyers while ruminating on the bloody history of each room. Well acted by all players, the rooms and their stories form the bulk of the anthology tales. Feeding Time: The second best story of the bunch, this one tells of an insurance salesman tricked into taking on a new role as ‘monster killer’. Unfortunately he’s a better salesman. The leading man here gives one of the best performances of the whole film and this was the only section that afforded a small chill. Good stuff! Blood Bath: Is the shower really eating its occupants or is this just a case of a hallucinating guy off his meds? This was one of the weakest with a director that seems to think buckets of blood and a bit of silly wordplay equates horror. It's mostly let down by some amateur acting and a ‘too short to enjoy’ runtime. Fear, For Sinners Here: Definitely the best of the bunch, this short is set on Christmas Eve with a young woman wrapping gifts as carolers come to the door and tension builds while the time ticks slowly towards a chilling climax. Almost free of dialogue for the majority of its runtime, this is carried by the impressive Jessica Schroeder as the protagonist, and though almost undermined by the manic performance of an exuberant caroler and the ill judged placement of some deadly candy canes, it still manages to be the most memorable and original offering here. The Deathday Party: A geriatric killer and his trophy wife decide to ‘treat’ themselves to the killing of a young woman as a birthday gift to him. They chose the wrong girl. Unfortunately this one's a miss; the acting is wooden, the gore silly and the dialogue just atrocious with the characters almost winking to the camera with their on-the-nose dialogue. I liked the ideas, and the selfie moment was cool, but the obvious ploys at ‘gross out’ horror (hemorrhoids anyone?) were cringeworthy. On the plus side, the movie references come thick and fast (shout out to the awesome Monster Squad!) and made this little cinephile's heart swell, and there are some inspired ideas here – somebody please make ‘The Dewey Deathibel System’ immediately! The minus side is that after these tales wrap up the film then takes an additional 17 minutes to try and tie the stories together and to add even more story; the film itself dribbling on and on like a leaky faucet way past the point of interest. It then added on a post credits scene. It was Return of the King all over again! It seems obvious to this viewer that the issue with this film is too many concepts allowed to run riot over its coherence so it had an unwieldy and overblown feel. Some tighter editing and better focus would have done wonders, and rather then cram everything into one film, take the time to expand and enhance the stories that work together while saving the disconnected stories for their own time in the sun. The ideas were good but not enough time was spent on them, and in the end, it’s just a jumble. Win some, lose some. 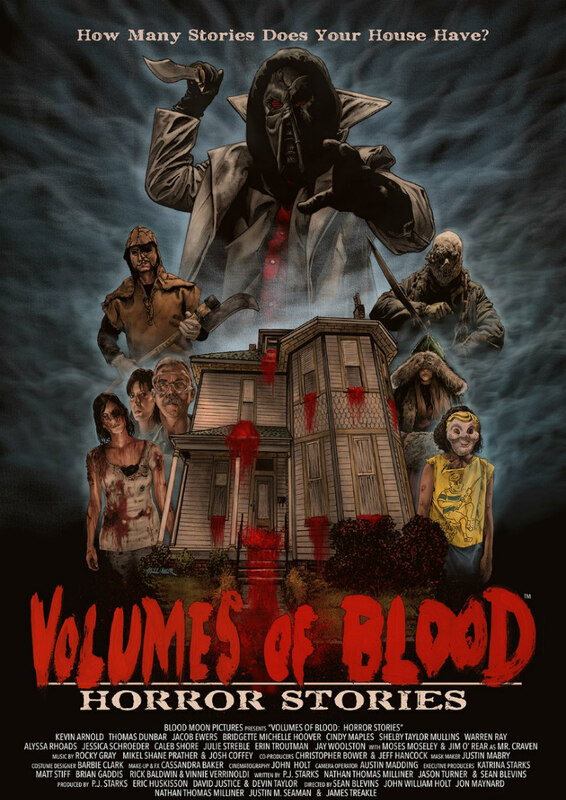 Volumes of Blood: Horror Stories is on DVD now.